Since I’ve been writing about gluten-free diets, I’ve decided to devote an entire post to my favorite gluten-free grain, quinoa. Did you know that quinoa is technically not a grain, but a distant relative to spinach and beets? Here is some additional info quinoa. Quinoa is a high-quality vegetarian source of protein that also has 3 grams of fiber per serving. In a ¼ cup dry serving, there are 160-175 calories (varies by brand). Quinoa is safe for people with Celiac Disease and gluten intolerance because it is gluten free and can be used in recipes as a replacement for gluten-containing grains. Another benefit of quinoa is its vitamin and mineral content. Quinoa is rich in iron, phosphorus and magnesium. Iron is especially important for women and for those following a vegetarian diet. For a recipe that calls for quinoa, cooking is quite simple. The most important part of the cooking process (in my experience) is rinsing the quinoa prior to cooking. Rinsing eliminates any granules of sand and also decreases the naturally soapy, bitter taste that can sometimes be present. To cook quinoa, use a saucepan and a small amount of oil/fat. I usually spray coconut oil or olive oil. Add ¼ cup portion to the pan just enough to lightly heat the dry quinoa for a minute without water. Next add enough water to cover the quinoa. For a ¼ cup dry serving, you can use ¾ cup or 1 cup of water. Simmer on low-medium heat. The quinoa is ready when the grains have softened, are soft when tasted, and when all of the water has been absorbed (sometimes more water needs to be added if it was cooked at higher temperature and still appears undercooked). Each quinoa grain has an O-shaped particle that will sometimes separate from the rest of the grain and both parts are edible. Quinoa does not require rinsing or draining once it’s done. 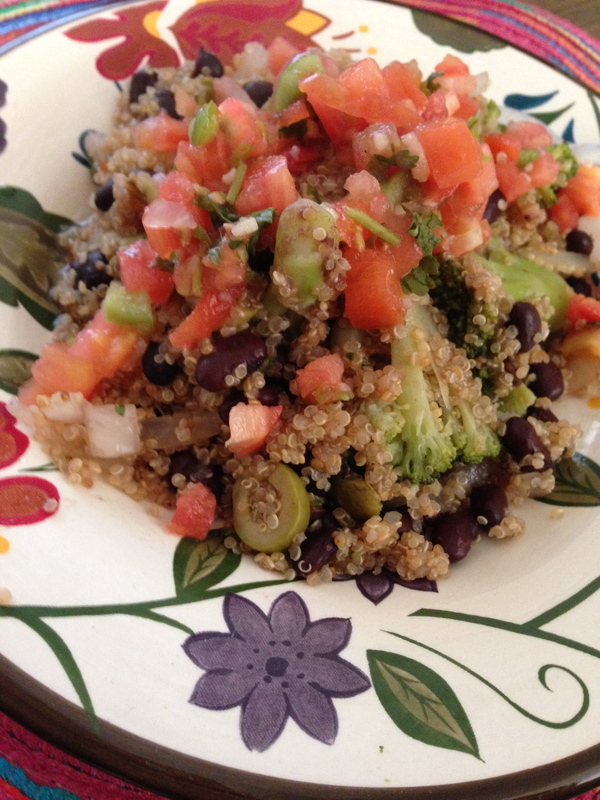 Quinoa in a mexican-inspired dish. Instead of rice, I used quinoa and added black beans, onions, broccoli, and topped with a generous helping of salsa and a few olives. Quinoa can be used in many dishes. My favorite ways to use quinoa are in place of rice or pasta. Instead of adding rice to a burrito or Asian-inspired stir-fry, use quinoa as the base. The same spices can be added to the quinoa as it is cooking or after it is fully cooked. Quinoa can also be used in ways similarly to oatmeal. Add cinnamon, nutmeg, raisins, and other dried or fresh fruit to hot quinoa for breakfast. You can also use quinoa when making your own granola instead of using oats. 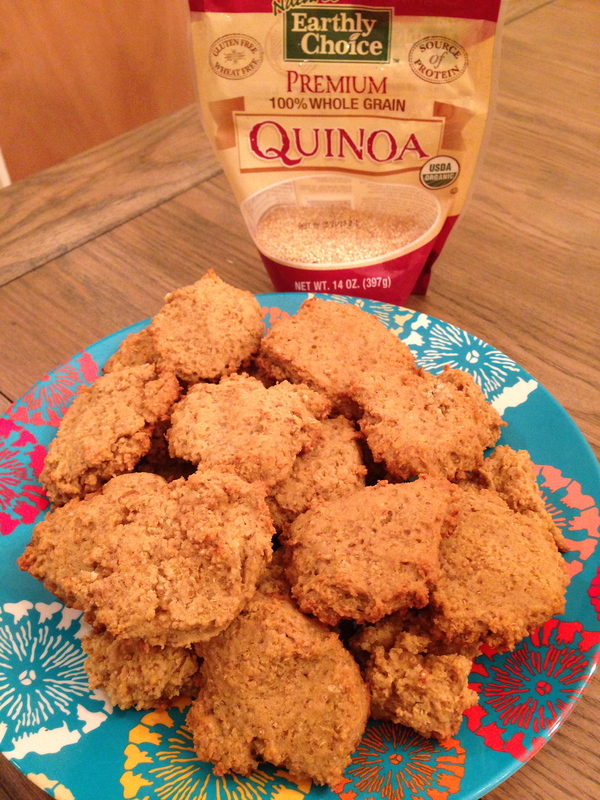 The most interesting way I’ve used quinoa is in cookies (I’ve included the recipe below). Quinoa is now on the market in a variety of food products, from quinoa pasta, quinoa flour, bread with added quinoa, and the list goes on. If you do follow a gluten-free diet, be sure to read the label of these products and make sure that wheat or other gluten-containing grains have not been added to the flour mixtures. Otherwise, enjoy quinoa in its many forms! Optional: Raisins, chocolate chips, coconut flakes, and or brown rice cereal. Measure the dry ingredients (brown rice flour, brown sugar, salt, baking soda) and mix in a large bowl. Add the wet ingredients to the dry ingredients using a wooden spoon or spatula to lightly mix the two together. Be careful not to overmix. Once the quinoa is finished cooking, remove from heat, and mix in with the combined wet-dry mixture. The mixture should now be the consistency of a chocolate-chip cookie dough. If not thickened due to the heat of the quinoa, allow to harden a little bit in the fridge. Grease a baking pan (cooking spray does the trick for me), and use a spoon to scoop out dough onto the pan I usually can fit a dozen on the baking pan, but it depends on what size you like. Bake at 375 degrees F for 10-14 minutes.